Modern day garbage dumps, which are full of harmful products and chemicals, are emerging as a serious threat to animal and plant life. A new study has found that these dumps are resulting in a shift in food habits of birds and wild animals. The main culprit is plastic waste which is known to cause health complications and disruptive reproductive patterns in animals that accidently ingest it. It also causes environmental pollution through chemicals leaching from it. The study examined the relationship between animal type and behavior vis-à-vis the risk of plastic ingestion. The researchers used direct observation as well as infrared camera-traps to monitor animal visits and food intake behaviour at two selected sites in Nainital district of Uttarakhand. The sites were monitored for two to three hours daily for a period of two months, and scanning was done every 10 minutes throughout the observation period. Feeding patterns and frequency of animal and bird visits to these garbage sites was recorded. A total of 32 species of animals and birds were identified feeding on the garbage. Based on the observed behavior of animal at the sites, researchers divided them into different groups. First is peckers, who used beaks to pull out food from plastics, including 19 species of birds. The second group is handlers—two species of animals with hand-like front body parts that were capable of segregating food from other waste. The last identified group is gulpers, who lacked hand-like organs as well as mouthparts and thus could not separate food from plastics. It was found that the average time spent by an animal or a bird at garbage sites is about 2.8 minutes. Among all the visitors, large billed crow showed highest contact rate with plastic, while Sambar showed lowest contact rate with it. Among the three types of animals, handlers and peckers were seen to come in touch with plastic more than twice compared to gulpers. 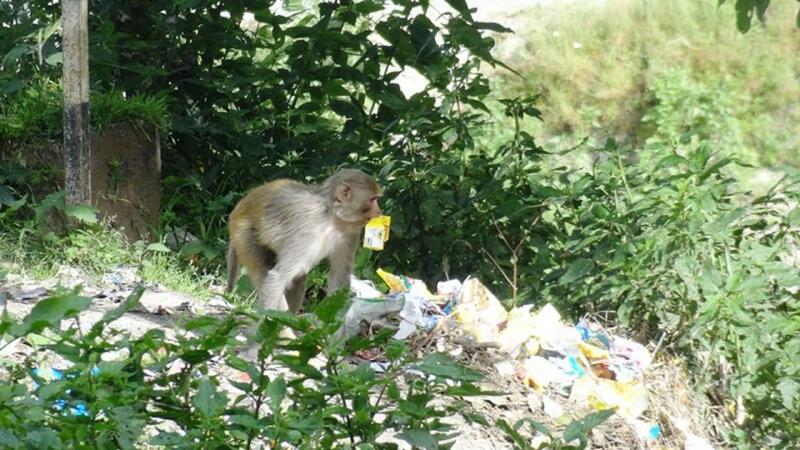 The research was conducted in Uttarakhand where tourists generate a lot of garbage in and around such natural habitats. Two garbage dumps in Nainital were taken as sample sites. The location assumes importance because of the presence of 200 bird species and 75 mammals in the area. The dumping site was characterised by leftover food mixed with non-biodegradable waste such as plastics, glass bottles, metal cans, light bulbs, cartons etc. “An ecological shift is happening where few animal species at some places are becoming more dependent on anthropological food waste. If we don’t enforce proper waste management strategies, particularly in and around natural sites and forest areas, it would have disastrous implications on wildlife,” pointed out Geetanjali Katlam, member of the research team. Garbage dumping sites have both physical and toxicological implications on animal life. Plastics present in garbage gets ingested by wild animals, leading to lethal injuries and damage to digestive tract which results in starvation, ulceration of stomach, reduced fitness, growth problems and premature death. The study concludes that there should be segregation of waste generated from domestic and other activities at the source in order to prevent harm to animals feeding on it and also to address the ecological impact of non-biodegradable waste accumulation.